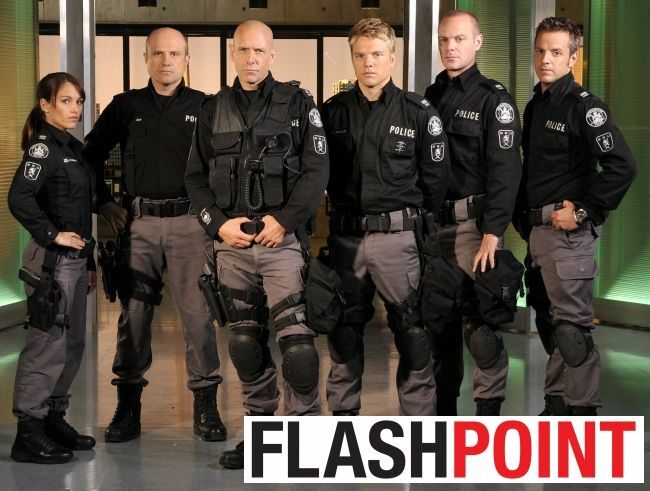 Aaron has land a guest starring role on the tv show FLASHPOINT. He is playing the character GIL COLLINS in the episode 4x14: DAY GAME. He's flying out to Toronto tomorrow morning for filming. I am soooooooo excited about this. I *LOVE* Flashpoint. It's one of my favourite shows. UPDATE: The SRU has a new team member in season 4. Clé Bennett as Rafik "Raf" Rousseau. Greg Parker, Spike, Ed Lane, Jules, Raf, Sam and Wordy. Good for Aaron. I haven't really watched the show much, but I am a fan of Enrico Colantoni. So maybe I'll give it another chance. Enrico was the whole reason I started watching FLASHPOINT when it first aired because he's "Veronica's Dad". And I watched Veronica Mars because I was a fan of his from "Just Shoot Me!". I've also become a huge fan of Hugh Dillon from watching FLASHPOINT. I just watched three season of DURHAM COUNTY because he's the lead. Yeah, the episode numbering is totally whacked. That's always bugged me. On the CBS website (http://www.cbs.com/primetime/flashpoint/recaps/) episode 'No Promises' is 4x03 and episode 'Terror' is 4x04. But on the CTV website (http://shows.ctv.ca/FlashPoint/Episodes.aspx) 'No Promises' is 3x10 and 'Terror' is 3x11. Season finale episode is 3x13 which would make the CBS version 4x06. According to an 'In Production' list (http://www.omdc.on.ca/Page3679.aspx) that I just googled, Flashpoint is filming Feb 14 – Sept. 15. If I do the math on that then episode 4x15 (which is production episode 4x13) would be the CTV numbering. I think. My head hurts. lol. I think that I keep track using CTV numbering because I think of it as a Canadian import. I can only assume that they use the Canadian episode numbering in filming since they are, in fact, filming in Canada. :) Stupid crazy US television industry always having to screw things up! LOL I agree with you and I live in the USA! Big Fan of Flashpoint. Hopefully it will work in to full time character. Mr Douglas can only make it better.